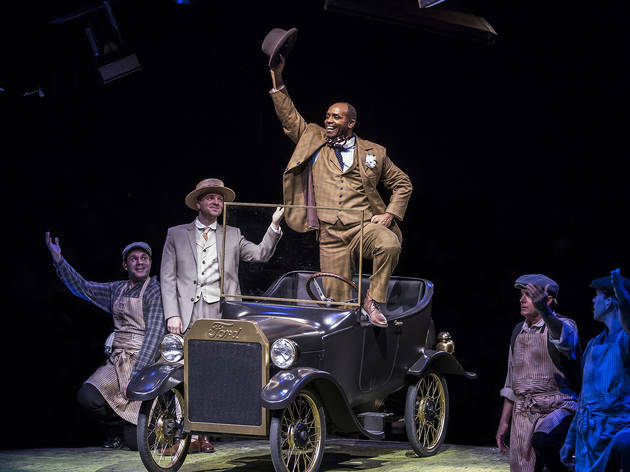 Director Nick Bowling stages the Stephen Flaherty–Lynn Ahrens musical adapted from E.L. Doctorow’s novel of social upheaval at the beginning of the 20th century. The Marriott cast includes Kathy Voytko and Nathaniel Stampley, of Bowling’s recent production of The Bridges of Madison County, returning as Mother and Coalhouse Walker Jr. respectively; Katherine Thomas, who beautifully essayed the role of Sarah in Scott Weinstein’s production of Ragtime for Griffin Theatre Company last summer, reprises that same part here. Also in the cast are Benjamin Magnuson (Tateh), Adam Monley (Father), Will Mobley (Younger Brother). Paula Hlava (Little Girl), Patrick Scott McDermott (Little Boy), Jonathan Butler Duplessis (Booker T. Washington), Christina Hall (Emma Goldman), Michelle Lauto (Evelyn Nesbit), Matt Deitchman (Henry Ford), Alexander Aguilar (Harry Houdini), Keirsten Hodgens (Sarah’s Friend), Terry Hamilton (Grandfather), Larry Adams (J.P. Morgan), Ken Singleton (Willie Conklin); the ensemble is rounded out by Curtis Bannister, Shea Coffman, Autumn Hlava, Christopher Kale Jones, James Earl Jones II, Ron King, Teressa LaGamba, Blace McGraw, Ben Miller, Zoe Nadal, Khadijah Rolle and Elizabeth Telford.